In this interview, Elaine Henderson discusses the history and varieties of Early American Pattern Glass (EAPG), and gives advice to new collectors. Elaine’s Pattern Glass School is a member of our Hall of Fame. My mother was our inspiration for collecting pattern glass. She collected it, and she died at a very young age. My sister and I inherited it and my aunt said not to sell anything until we were older. She had some good stuff. My sister called me one day telling me she found a goblet in the pattern that mother had, so I decided to look. The first pieces we found were some wine glasses. Once you find a treasure, it’s what gets you started. You figure out that you can identify something of value that other people can’t. We started buying about 19 years ago and I can’t exactly remember when I started selling. But a few years later I realized I couldn’t store and have everything that we wanted, and we realized we really liked it. It’s like a treasure hunt. I can go in an antique store and pick out pattern glass in about a minute and a half, so once you spend hours, days, and months learning it and buying it, you have knowledge that allows you to make wise purchases for resale. When we first started we bought the wrong stuff sometimes, so those pieces we call tuition in our education process. My two sons were in computers, and one of them said that using a database and the Internet would be great for a pattern matching service, and he was right. He was really the guiding force and got me a website thirteen years ago. The Pattern Glass School is the main site and I added the store and other sites to that. There are a lot more forms that I haven’t completed yet, like butter dishes, creamers, pitchers, covered sugars, relish dishes, or compotes. We didn’t realize when we started how many pieces would be necessary to make a pattern-matching service viable; multiply the number of patterns by the number of forms of patterns and its a lot. I also have a virtual museum where people have sent me photos plus some of my own pieces. Collectors Weekly: Do you collect all forms of Pattern Glass? Henderson: We have a lot of forms since it’s such a big collection. My husband used to focus on toothpick holders, so we have more of those than anything. Among other things I focus on pickle casters with original lids and covered mustard containers. They’re hard to find and they’re not too large, especially mustard containers. We also have a lot of toy pattern glass, hundreds of pieces because we buy it and nobody knows what it is (it’s children’s dishes made out of pattern glass). There’s maybe not more than 12 or 15 patterns that matched exactly in the toy sets. There’s a lot of new toy sets made now but we only have the 19th Century ones. If I’m really looking for something I’ll contact one of 10 or 15 people I know who have large collections and see if they have it. We’ve bought in the filthiest of the low down flea markets and from the highest antique stores in Houston. We’ve bought mostly just in regular antique stores, but they’re going away! Collectors Weekly: How many forms are typically in a pattern? Henderson: A couple of patterns were made in almost 100 forms. Many patterns were made only in a goblet or bread plate. Basically, most patterns started with a goblet, some would have some table sets, which are the first serving sets a pattern would have. A table set is a spooner, covered butter, covered sugar, and a creamer. It’s called a 4-piece table set, and that’s the rock bottom basic set. If there’s more than a table set in a pattern it will have a celery vase. Which is weird, because we’re talking about the 1850s through the turn of the century and it was poor people’s glass and poor people couldn’t afford celery. Nobody can figure out why almost every pattern with more than a table set has a celery vase. It makes no sense, because they all ate tomatoes but there’s no tomato dish. Some people think it was kind of a status symbol, but I’m not buying that, not for every pattern. These people were not that kind of people. The people who owned pattern glass initially were people of the earth, merchants, farmers, and ministers. My paternal grandfather was a physician in Arkansas and my maternal great grandfather was a minister & a circuit rider (who rode around and performed weddings and funerals in small towns where there was no minister) in Oklahoma. Both of their wives used the same pattern. So that’s the pattern that we collect and I have just about everything made in that pattern. It’s called Feather, also called Doric. Collectors Weekly: How many patterns are there? Henderson: Probably about 1300, nobody knows for sure. One thing about pattern glass that’s a given, there are no general rules about pattern glass without exceptions, which makes it hard to learn about. For example, typically a pattern costs more in green, less in clear, and much more expensive in amber stained, because one is more or less common than the other. 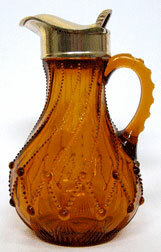 But there are a few patterns that were most widely made in the amber stain and more in green than clear. There aren’t many dealers in pattern glass who I would call specialists. Very few pattern glass folks consider themselves “experts” because the subject is so vast and more is continually being learned about it. Hundreds of factories produced it over 60 or 70 years so there were a lot of variations and there have been a lot of reproductions. It’s not something where you can just look in one book, we have 180 books on pattern glass. Collectors Weekly: Who were some of the big manufacturers of pattern glass? Henderson: There were hundreds of factories that made pattern glass between 1850 and 1910 and none of them lasted through that entire era. Some of the better known names are Northwood, The U.S. Glass Company, Heisey, Fostoria, Bryce Brothers, Higbee, Ripley, and Duncan. McKee is also a great one, they made the feather pattern. Gillinder and Sons in Philadelphia made some of the best and most popular patterns. I like all of those manufacturers I just named. Of course the English made pattern glass too, but their patterns are different, more individual pieces instead of place settings or table sets. We specialize solely in American pressed glass. EAPG means Early American Pattern Glass. A lot of companies changed their names over the years because they changed owners, went bankrupt, or burned. A lot of factories burned, because of the production process and they had wood buildings. Many factories started up in New England on the coast, in Massachusetts, and then they jumped out to Pennsylvania, mostly to Pittsburgh. Then they followed the Ohio River Valley into West Virginia, Ohio, and Indiana. The precursor to pattern glass was the first manufactured product in America, back in the 1700s. You don’t find that glass anymore, it’s in museums. But it wasn’t really pattern glass because it was blown not pressed. In the 1820s, they invented the pressing glass machine, but the kind of glass they made at first was crude, really thick and wavy. They used it for drawer pulls. It had so many impurities in it that they used very busy patterns and most of it has dots all over it. It’s called lacy glass because of the dots, there was no smooth, clear section of it. It was crumby glass, usually chipped when it came out of the mold, so if you find lacy glass without chips, it’s very likely a reproduction. Then in the 1840s they started making some higher quality pieces of glass that people could use, making it possible for poor people to own glass dishes. It was cheaper to make than blown glass. Rich people had glass from Europe, but poor people drank out of tin cups and ate off wooden plates. It’s so interesting to me about how it must have made the women feel to have their first glass dishes after only having tin. There wasn’t any other glass so the only competition was from other manufacturers. Even when patterns were patented, other companies had no compunction about stealing them. They frequently copied popular patterns and that accounts for variations in some patterns. Collectors Weekly: What is “sun purple”? Henderson: Flint glass was the first glass pressed. They used the flint as a clearing agent to made the glass clearer. It would be a greenish color and they figured out that if they put lead in it, it would clear up the color cast. They did that in the 1840s and 50s. In the 1860s, during the Civil War, the lead was needed for bullets so somebody came up with the idea of using manganese to clear the glass instead of lead. It was much cheaper and available. They did not know that the inclusion of manganese caused the glass to turn purple if it was exposed to ultraviolet light from the sun. They used that formula for 50 years. At some point somebody realized that old glass turned purple in the sun over time and decided it was fun and pretty. Eventually people figured out that those germicidal lamps in labs could do the same thing as the sun in a matter of weeks instead of months. It became a fad and it grew in certain parts of the country, not back east, but out in southern California and Arizona, they started doing thousands and thousand of pieces. People back east didn’t know about it, and it was sold as an antique for high prices. It started in about the 1970s and didn’t get really big until five years ago. Basically sun purple is a ruined American antique, it’s irreversible, and a travesty to history to alter an antique. But, people are becoming educated, I’m getting the word out and it’s slowly going away. I’ll keep going until it’s gone. Collectors Weekly: How do you identify reproduction pattern glass? Henderson: In clear glass, the main clue is it doesn’t glow yellow under a black light in a dark room. But the inverse of that statement is not true. If it does glow yellow, you can’t tell if its old or new. The second thing is the weight. Reproductions are usually heavier than the original. Also, reproduction glass feels slick and oily compared to old glass, so if you run your finger over it, it’s not going to be sharp. Most reproductions are easy to tell if you have an old piece and a new piece. The trick is to be able to tell when you have just one piece. You have to feel a lot of glass, it’s a tactile expertise you get from experience. A lot of dealers in the Early American Pattern Glass Society, many of whom are sadly going out of business, were so good to mentor us as beginners. Bill & I spend a lot of time building our web site to help people new to the field, out of respect for those who went before us. Collectors Weekly: Where do you do most of your research? 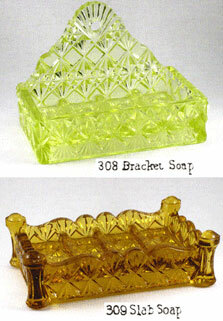 From Dave Peterson to The Pattern Glass School: vaseline and amber bracket soap dishes by King & Co.
Henderson: Books. There have been some really good books on factories. Those are the best books, about individual manufacturers, because the writers confine themselves just to the patterns from those companies. There are a lot of books on forms, too. And books on patterns that reflect historical events like political events. There’s a pattern called Liberty Bell made by Gillinder in 1876. There are also patterns named after states, most of the states that were states back then have a state pattern named after them. The closest thing to a pattern glass bible that people go to for values and information are the Reilly & Jenks books – the first edition is from the late 1980s and the second is from 2002. There are some really terrible books about pattern glass and some really good books about pattern glass. I have pointed out both the good and the bad in our web site book store. Collectors Weekly: Any advice for someone just starting to collect pattern glass? Henderson: Go to PatternGlass.com and read “Ask Granny” and go to Pattern Glass School. Buy a couple of the good books. Then buy pieces that you think are good and research and study them. I started with the Metz books, they’re the best to start with because they’re just goblets, and there’s really good advice about the patterns and designs. I’d only buy from dealers who know pattern glass, but there are not a lot of dealers who are very knowledgeable. Henderson: I want to stress the sun purple issue, that it’s out there and that people are still altering history. It’s a crisis in the pattern glass world because pattern glass is going away, and turning it purple is making it go away even faster. Also, I’ve also had some really funny stories and good friendships made through collecting and dealing. Some women call me and tell me their life stories and I don’t even know them. It’s such a small world. It’s a fun thing, I help a lot of people and a lot of people help me. I have a pressed glass spooner with a basket weave pattern. It has a pedestal and a lid. I would like to know how to research it by a name. Mine is clear but I also have a blue one. I understand there are pitchers to match. I have been told it is early american pressed glass. Joyce, spooners don’t have lids – if they did they would have to be very tall to cover the tops of the spooners sticking out of them. What you probably have is a covered sugar bowl. Since sugar early in the EAPG period came in chunks, sugar bowls were larger than they are now. There is an EAPG pattern called Basketweave & it might be what you have. But its hard to tell without seeing a photo because there are SO many EAPG patterns. You might want to check out PatternGlass.com and look around the Stores. We have a few pieces of the Basketweave pattern there. I am just now putting an amber pitcher in that pattern in the Water Pitcher Store. i have old glassware-sugars, gwine glasses fostoria pattern glass and some i dont know whose they are. I am trying to find an outlet for these things.i have a cable/ring sugar bowl- my aunt was a collector of 350 antique compotes and 150 sugar bowls. where do I go for information on patterns with currant prices.? Dear Mrs. Henderson, thank you for sharing your interview. In some ways, it reminded me of my first reactions and impulses towards American Pattern Glass. It remains an area of interest and fond appreciation for me. Congratulations on your website and postings. I imagine there are still many secrets and treasures to be found. Let’s keep looking. Thanks to Google, I just read the article about you and your shop in Collector’s Weekly, as well as the questions that are still being sent. I do not collect Early American glass, but I found it so interestingly written I read it all. I asked Google why some antique glass turned purple. Now I know more than I need to know, but delighted to know that a perfectly plain glass compote that sometimes in the just the right light seems to have a purple tinge to it could have been made before the war between the States. I needed to know something about it before taking it to an antiques mall in Phoenix where I rent a booth to dispose of everything that will not fit into a townhouse! Many thanks. I am trying to help an elderly aunt sell her collection of 400 pressed glass spooners. I do not know the patterns and am assuming that most are in good to excellent condition. She lives in a small town, Poultney, Vt and they have a town wide yard sale over Columbus weekend but I am unsure if that is the best way to manage these items. I live in Mass.but will be there over that weekend.Any advice you could provide would be appreciated including dealers, autioneers, selling as a collection, etc. I am clearing out a relatives old house. I have found some interesting glassware which I don’t know what type of glass it is. Pale green, very primitive looking and totally full of tiny air bubbles as to give the glass a frosty look. Some pieces are also premitively etched with designs and all have somewhat rough pontils. What is this type of glass known as? Today I visited my favorite antique store, searching for hand-painted fruit plates to liven up my dining room. As I was walking down an aisle, a beautiful compote sang out to me and I gathered it up in my arms, rushing to the front of the store before anyone else could see the treasure I had found. Several hours later, I learned that it is a Bryce Bros. Curtain/Sultan compote. Several hours after that, I found you. Thank you for sharing knowledge and a love of beautiful pressed glass with others. I appreciate you! I purchased a three piece crystal set of Belmont #100, Daisy & Button with Lacy Edge. Unfortunately the cover to the Sugar Bowl was broken, I have been looking all over the internet looking for a replacement top. If you can help me to locate one, I would be so in your debt. You have a fabulous web site, I have learned so much about EAPG. We have an odd water pitcher that belonged to my grandmother–it is white ‘milk’ glass with a wonderfully odd monkey pattern. It is very heavy, with a rayed pattern on the base and a scalloped top edge. Are there matching goblets, wines, etc?? Katrina, I beleive you have one of the rarest and most valuable water pitchers made in pattern glass. From your description, I believe you have the water pitcher in the Monkey pattern, attributed to George Duncan & Sons, Pittsburgh, Pa., circa 1880’s. Please go to your local library and request a copy of “Early American Pattern Glass:Collector’s Identification & Price Guide”, 2nd Edition by Darryl Reilly and Bill Jenks. This is the 2002 edition. The Monkey water pitcher in opalescent(milk glass) is valued at $10,000.00. ken Kercheval, who played J.R.Ewing’s rival, Cliff Barnes collects this pattern among other figural pattern glass patterns. 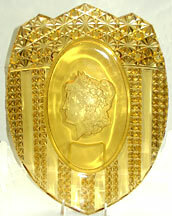 He was featured in “Glass Collector’s Digest, Volume 1, Number 5, February/March 1988. The full page photo of him and his wife opposite the first page of the article, shows him holding the Monkey opalescent cream pitcher. the caption of the photo says “Ken and Ava admire their much prized monkey opalescent cream pitcher. They are searching for an opalescent water pitcher in the same pattern.” I do not know if they ever found one or not, but if you are interested in selling your pitcher (providing it is the monkey paatern) I would try and contact them. Either way, please take good care of this extremely rare piece as there are very, very few in existence. You are very lucky that this pitcher struck your grandmother’s fancy. Oh, almost forgot, there is no goblet known in this pattern, but there wee tumblers ($375.00 each). Other pieces include an open master berry bowl, butter dish with cover (pictured in Jenks’s book),celery vase, creamer, 2 styles of mugs, pickle jar with cover, round flat sauce dish, spoon holder, sugar bowl with cover and waste bowl with scalloped rim. Good Luck!!! I have acquired from a yard sale a bright yellow hand blown pitcher. A antiques collector of many years looked at the pitcher and thought it might be from a company in West Virginia that has recently gone out of buisness. He said the man who was the artist came from Germany. He thought the pitcher might be worth about $300.00. The pitcher is very stunning and sure to catch the eye, as it did my husband’s. He brought me back to the yard sale to look at it and I loved it and bought it. The pitcher has a faint pearl look to it while being bright at the same time. I also bought 9 yellow dessert cups. The cups are a clear yellow and appear to be molded with the base being hand blown. The dessert cups are thought to be of some value as well. Would you have any information on this company who is no longer in buisness. Thank you. like a watkins salesman, aboout 75 years ago. She got these with a purchase, and put them in her Dowery. I can’t find anything on them. 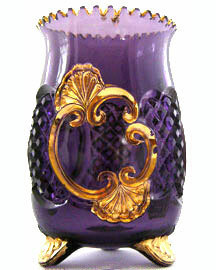 I have just purchased a cordial glass that has a purple thistle on the bowl and seems to be at least 85-100 years old. It was purchased in England. We have been given a Miss Liberty glass bread plate and are unsure of the maker. From what I have read it is circa 1891 and could be either Richards and Hartley or Riply. It is approx 12 1/2 inches by 9 1/2 inches at its widest pooints and does not appear to have any kind of makers mark on it. HI , I have a collection of glass items, I think, Fostoria Federal Pattern, early 1900’s, clear glass etched with circular design eagle at top, has 10 stars around plate two garlands on either side of circle holding eagle, wheat shaves at bottom of circle. Can not find any such pattern, maybe this was a commemerative special run..not sure. I also have stemware with same pattern, plates, cups and saucers. Hello! What an interesting & informative site! I’m not sure if what I have is something you would know about or if it’s even antique, for that matter. I have an iridescent white vase, measuring 8″ by approx. 3.25″. It is molded (pressed?) glass, depicting a tree trunk. The color is more like mother of pearl than white, actually. I can just make out the seam line on either side of the piece. I cannot find any markings, whatsoever. I’ve tried various online searches and keep coming up with nothing! I was just wondering if you have found any information on the etched glassware that my mother called “Post Pattern”. I would love to know if that is really the name for it. Any information is appreciated. Thanks. We have a set of Liberty Bell glass from my grandmother, including numerous serving pieces, such as covered dishes ,pedastal bowls, salt and pepper, oval platters, as well as 10″ plates (8), 6.25 plates (8), 13″ oval dishes (12) & goblets. Other pieces, too. Any way to get the true value of these? Of all the free services we provide to learners of EAPG, providing values is not one of them. There is a valuation service for EAPG on the web at http://www.eapgpatterns.com. It is not free but it is well worth the $35 it costs to join. Modene & Glenn are very good people and tell them that I recommended for you to come for help there. PS I received notice that this comment had been posted. Until now I did not know that there were comments below my interview. If you have asked me a question & received no response its because I didn’t see it. Collectors Weekly is doing a great job, isn’t it? Nice to hear from you again Pam! I’d love to see your ‘undocumented’ historical EAPG. My email address is Elaine@PatternGlass.com I have put it on our Contact page for the few folks who are unable to reply to my email links. I just aquired a small gobblet in blue glass. It looks like carnval glass. The design includes what appears tall grass with a bird in the middle, almost like cat tails. and at the foot of the small gobblet a circle of fish. The gobblet looks about the size of a cordial. I need help identifying it. Elaine, thanks for your information. I have learned that the item in question is a toothpick holder. That is all I know. About 8 years ago I purchased a lazy susan type cake plate. It is in 3 pieces. had purchased a 1920 estate. I have no idea who made this item but would like to know more. Thank you. To Jo Medford. The style of cake plate you described was not pressed in America 100 years ago. My husband & I have a pattern-matching service exclusively for Early American Pattern Glass (EAPG) tableware ca 1850-1910. And that is all we know about. So we are of no help in glass made after that period of time. I am new to collecting EAPG cake stands. I recently came across a Moon and Stars cake stand at a high school flea market. The vendor was the owner of an antique store. The sunlight was very bright and I did not notice until I got home that there was a clear substance that connected the top to the base. After I researched this I found that this was a sign that the cake stand was a reproduction. Needless to say I was very disappointed. I don’t know if the person from the antique store knew that this was a reproduction but I learned that you cannot count on people who own antique stores to necessarily know what they have or be upfront about it. Thanks for your information. I keep learning every day. Before you go kicking yourself and the seller, determine if the “clear substance that connected the top to the base” was a wafer connection. You can read about those at Pattern Glass School here….. http://www.PatternGlass.com/School/Wafer . If its a wafer it is more likely, but not guaranteed, to be original. That does not eliminate the better judgement of spending money where you can count on true value. I would like to know if the gillander and sons “CLASSIC”pattern,i:e creamer, celery vase,log feet was ever reproduced. The tree rings on the log feet are barely visible and the acid etching flows into the arches.The details on the three figures are so fine and extraordinary. I have an early flint sugar which has a frosted coating on the inside of the lid and base. It looks intentional, will scratch off. It is not a residue and is uniform in appearance. I have friends who are serious collectors. We are all puzzled. Any ideas. 14. david, re your “Monkey opalescent” ~ this is not “opalescent”, it was called Opal, pronounced o-PAHL by early glassmakers. I am researching whether or not EAPG or other 4 part table sets- creamer, covered sugar, covered butter, spooner-, existed in the Lacy flint glass time period 1830s-40s? I do know that official 4 part table sets were made as early as 1850s in full flint early eapg patterns, but before 1850s??? Good question, hard to find answer that is conclusive based on good verifiable research. Anybody know??? Let me know thanks! I hope this message board allows people to email me directly, never used before no idea trying for first time. “ ” When rumors circulated that Kesey planned to put LSD in the water supply of Winterland, Graham pulled the plug.